Advanced soccer passing drills are more fast paced, and intended for training with one, or two touch passing and moving to receive the ball back. 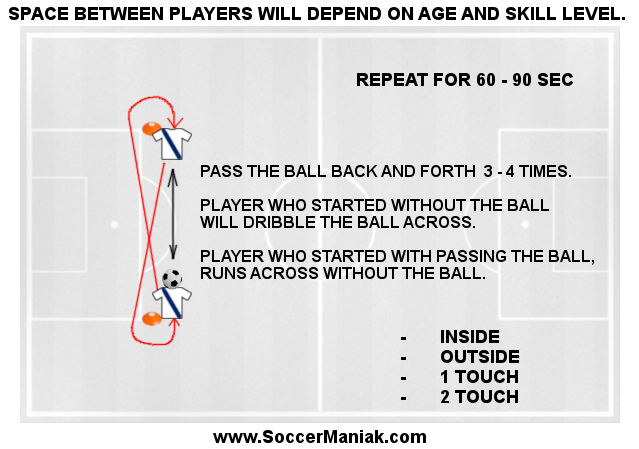 Players will need to have a good understanding of passing the soccer ball, and using the correct technique to pass with pace and accuracy. Advanced soccer passing drills can be adapted from many different soccer passing drills by adding faster pace, and firm, accurate passes. There will be lots of short passes, and movement off the ball to receive it back, in an attempt to keep the possession of the soccer ball. Players should constantly move and try to spread out to create more space for passing lanes. Minimum number of players is 6. Mark a rectangle on the field with cones, 40 m/yd x 20 m/yd. Split the rectangle into 3 parts. Left Side 10 m/yd, Center 20 m/yd, Right Side 10 m/yd. Split players into 2 groups. 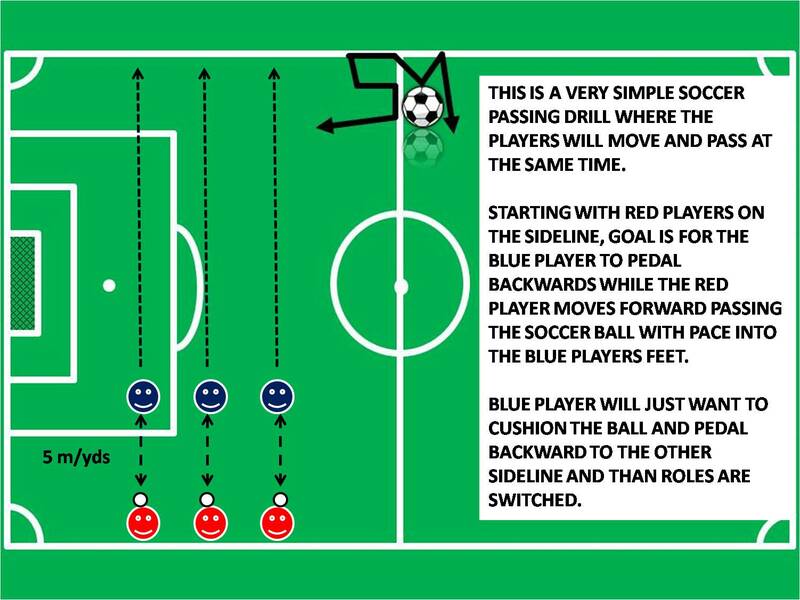 One player from each group will take position in Right and Left smaller spaces. The rest of the players should have even teams, and start in the center space of the training rectangle. Players inside the center rectangle will use one, or two touch passing, in an attempt to reach 15-20 passes. The opposite team will defend, and try to win possession to attempt 15-20 passes and earn a point. Every 15-20 passes earns a point to the team with possession. Passing game will be played in 5 min intervals. Team with ball possession will have 2 extra players in the left, and right space. These players cant leave their square, but can be used as extra passers for the team with the ball. 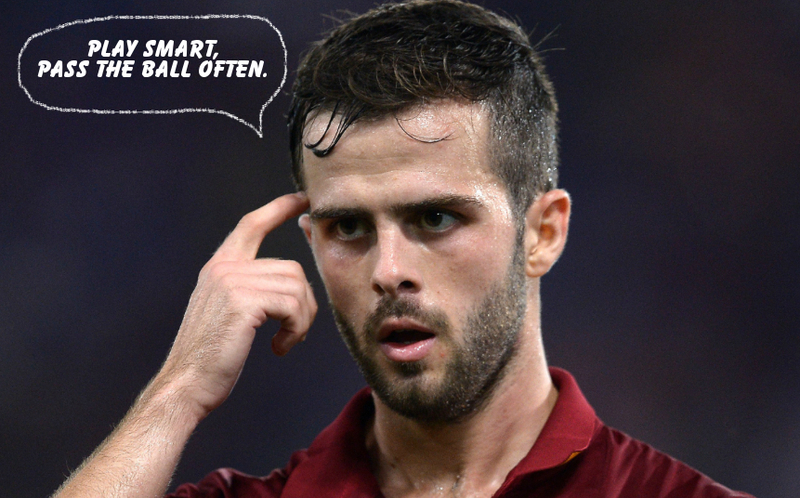 Encourage speed of play, with more passes, and faster pace. Adding punishment at the end of each 5 min increment may motivate players to work harder through this passing drill. Pass with the inside of the foot. Toes up and ankle locked. Eyes on the ball as you strike the soccer ball. Never stop movement after a pass. The whole point of the game is to pass and move. Good habit is to always step towards the ball to meet the pass, and after passing the soccer ball, move into empty space. Passing the soccer ball is only one part of the job. Movement after the pass makes the pass complete. Don't play the ball, play the space.